With blogging and other social media, I think this was inevitable. It's not just this food magazine though. Lots of magazines are seeing their sales slump. Same with newspapers. More and more stuff is going to online only versions or simply closing down. No. And that means less trees being cut down to produce those glossy mags which cost much more than they are worth. Brad- the future of all print media, I guess. However, well before foodies there was Gourmet Magazine, which I really enjoyed their restaurant reviews. Rowena- judgement redered in favor of the defendent, then. The spotted owl thanks you all. Oh! I heard about this on NPR today. Ruth Reichl could only say she was stunned. They killed Modern Bride as well, both for "lack of ad revenue." Honestly, the entirety of a bridal magazine IS advertising.... Wondering what else is on the chopping block. A lotta other mags should shut down too. Ann- Gourmet magazine was like National Geographic in that they wrote on things that you wouldn't find readily available elsewhere before the Internet. Gourmet was also about travel too, at least, traveling to somewhere for the expressed purpose of eating. Yeah, Gourmet's recipes were high end stuff. But who cares when you have your own personal chef, or imagine. Mind you, I don't doubt for a moment that their travel articles were romanticized when necessary. 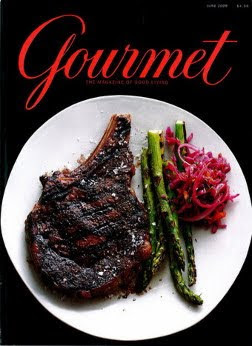 Haven't read Gourmet for years, but I did enjoy their restaurant reviews because they had the best restaurant reviewer, bar none, the restaurant reviewer before Andy Birsh, and it was a joy to read his reviews because of his polished writing style interspersed with a unique brand of humor, or in his own words, "and all that corn." Nate- or offer subscriptions for free as a loss leader to induce advertisers, lest go the way of print media. Some publications like Surfer magazine, et. al, readers are into the latest equipment offered by manufacturers, so those might just survive. I just ok'd the use of one my images on an italian food mag (gratis) so I hope they don't fold. Hell, they should become more popular with my blog name in there. Buahahaha! Rowena- which photo? I'd like to post it here, as well. Hmmm...I should check the contract agreement. No wait, I didn't sign anything since I thought it was a website at first instead of a real magazine with pickchas and stuff (so much for trying to be in-the-know).